Leasing at Jersey City’s newest tower — The Vantage — will begin in July. Located at 33 Park View Avenue (formerly known as Park Avenue), The Vantage is a 45-story, glass-enclosed luxury tower. 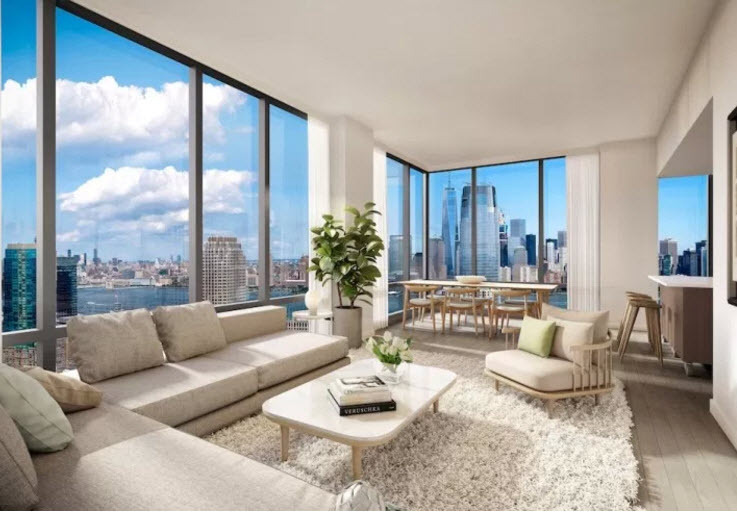 The 448-unit building prides itself in offering living spaces that are larger than what you’d normally find in Jersey City or its surrounding areas. Designed by S9 Architecture, the tower will house 56 studios averaging 559 square feet, 310 one-bedrooms averaging 809 square feet, and 82 two-bedrooms averaging 1,242 square feet. All units with have floor-to-wall ceilings and views of the Hudson River. Residents will get all the amenities expected from a new luxury rental including quartz countertops, master baths with double sinks, 24-hour concierge, an outdoor zero-entry swimming pool, cyber cafe, and a full basketball court. Homes will be available for immediate occupancy with pricing from $1,995.